BASKETBALL. If there were any doubts of Pemba Warriors being a resurgent force in 2017 National Basketball League season Sunday’s 81-52 laugher over traditional rivals and record holders Falcons preceded by a 72-66 blowout of Betway Power may be the brief moments that idea began to crystallise for an average fan. The ‘title contenders’ truism—at least if their run of form is not hot air—can truly appear in the same statement with the two-time NBL champions: a brief laughter in a benevolent landscape for Warriors faithful. Whether Warriors searching for a first league crown since 2012 have the guts to oust dictator City Oilers on the National Basketball league title calls for heated debt, the latter’s patchy form notwithstanding. What is not debatable, however, is that the Kyambogo-based side have exuded hallmarks of a title contender. Critics have parodied them for not “being soft on the eye” but the general consensus is that the Ronnie Mutebi-coached side do enough on court to chalk up baskets convincingly. Ronnie Mutebi, who was parachuted onto Warriors hot seat amid low fanfare replacing Sam Obol, believes the hype surrounding his team is justifiable. “If we remain focused and united, we can do it (winning the title). We have a pool of experienced players who have played at top level and know how a championship can be won,” Mutebi said. After seeing their side fall to UCU Canons in last seasons’ play-offs, Warriors technocrats oversaw a squad overhaul in the off-season that marked the arrival of tried-and-tested players. Former Falcons veteran Congolese Micheal Bazangu, who has shown flashes of his enduring ability, was recruited. Said Amis, Aaron Ajjio, Daniel Gaaki and development league whizkid Stanely Mugerwa were also part of an ambitious recruitment drive. The new cast added to an already available good cluster of players in Syrus Kiviiri, Mark Opio, Jude Ochen , Ceasar Kizito, Ronnie Kasewu and Phillip Amney. Coming at the back of an important win over Betway Power, Pemba Warriors did not rest on their laurels, instead they whitewashed Falcons with consummate ease to keep their 100 percent start to new season intact. Winning in five consecutive outings, they remain the only unbeaten side in the season thus far. While the win against Betway Power was orchestrated by Bazangu notching a game high 36 points, it was Mark Opio who stole the show against a clueless Falcons side with 15 points. Jude Ochen added 12 points, Said Amisi chipped in with 11 points and 9 rebounds. Syrus Kiviiri dropped dagger after dagger, Opio threw fancy passes and Amisi grabbed a handful of steals. Warriors ran the show, and all Falcons could do was to watch helplessly. Vinie Jurua starred for Falcons (1-4 run) with game high 15 points proportional to Mark Opio’s. It was the latest in the string of high profile scalps the Kyambogo-based side has pulled-off much to their fans’ delight, with title contenders UCU Canons (65-60), Betway Power (72- 66) and play-off hopefuls Our Savior (57-44) all falling victims to the 2012 Champions’ wrath. They also ran riot over army side UPDF Tomahawks 80-55. 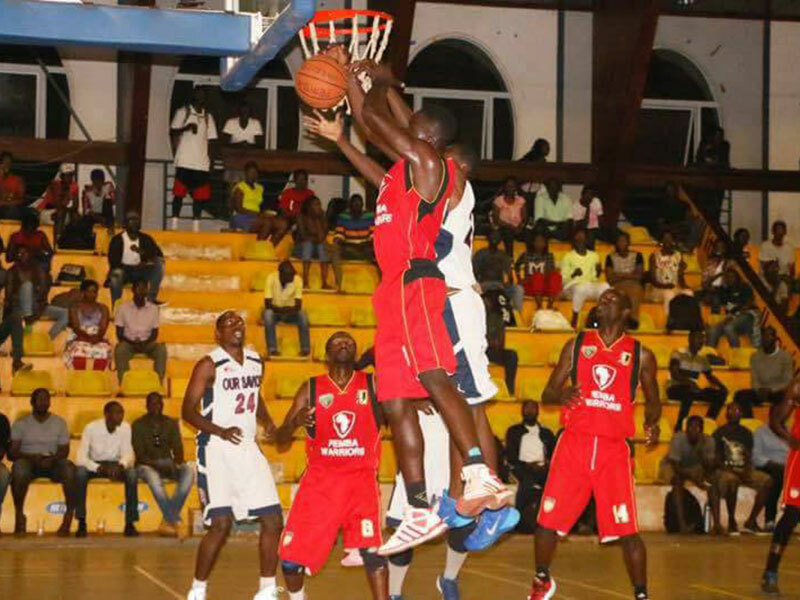 Warriors , who boast a 4-0 run, return to action against giant killers Ndejje Angels, who are fresh from beating defending champions City Oilers. Betway Power returned to winning ways as they overcame Our Savior 79-73 on Sunday. The five-time champions were downed by Pemba Warriors on Friday night, but Paul Odongo top-scored with 21 points to ensure they avoided back-to-back defeats. Isaac Afidira and Kenyan Michael Makiadi came in handy with 17 points and 12 rebounds apiece.